Bali is known for its achingly beautiful scenery and landscapes; an exploration into which is a spiritually awakening experience for many. Spending time in ‘natural Bali’ is filled with peace and tranquility, giving people the perfect environment to ponder life and widen their horizons as an individual. Besides the island’s beautiful underwater world, white sand beaches and unique culture, Bali hides a reservoir of beauty and charm that is often forgotten; these are the great lakes of Bali. These majestic lakes are well worth your time and effort, as they showcase the beauty of Bali that lies beyond the coast. Make sure your cameras are ready for what is truly a visual feast. Let’s begin the adventure in central Bali with a visit to Lake Bratan. Situated in a crater of an inactive volcano, Mount Catur, Lake Bratan is the second largest lake in Bali and is back dropped by the majesty of Mount Bratan. 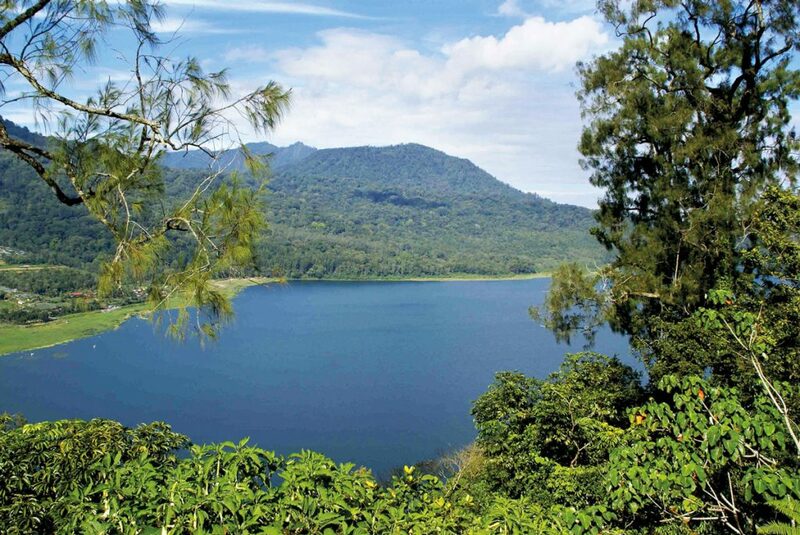 Located in Bali’s central highlands of Bedugul, this lake is a favourite tourist attraction. Its high altitude allows visitors to enjoy respite from the hot and humid weather. The surrounding area is a natural spectacle offering splendid views of mountains and greenery. The lake is surprisingly shallow with a maximum depth of only 22 metres. Irises of numerous colours – yellow, fuchsia and magenta – dot the edge of the lake. The misty peak of dormant Mount Catur looms above. Found around the lake are three 25-metre-deep caves excavated by the invading Japanese during World War II. There are also a few shrines worth exploring in the vicinity of Lake Bratan. Another popular sight is Bukit Mungsu Market (or Pasar Bukit Mungsu), located in CandiKuning. Visitors can buy a variety of fresh spices, including nutmeg and turmeric, fruits and vegetables. Due to the cool weather there, you can also pick strawberries on the fields, a unique find considering Bali’s tropical climate. There are so many activities you can do around the area. The surrounding mountains are popular destinations for hiking and trekking, offering routes of various levels of difficulty. Water sports lovers will rejoice with the abundance of water activities available. Rides on pedal boats, speedboats or traditional boats known as jukung are all available. Other types of water sports that you can enjoy include water-skiing, parasailing, jet skiing and paddle sports. Swimming is permitted, of course, only if you can stand the cold waters! Lake Bratan is considered to be the most holy lake in Bali, as it is a home to one of the most famous temples, the Ulun Danu Bratan Temple, which dates back to stories told in Balinese mythology. 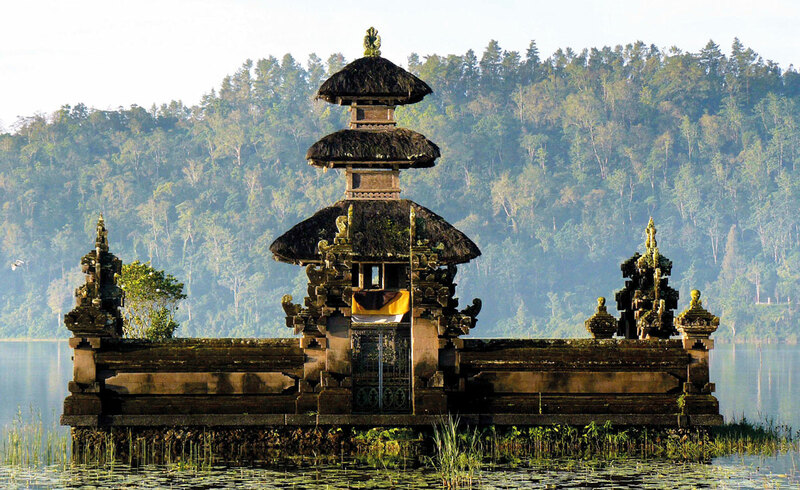 This beautiful 17th century temple of Ulun Danu, which appears to float on the water, is dedicated to worship Dewi Danu or the Lake Goddess. Offerings are made at the temple on special festive occasions, as it is believed this will bring economic prosperity to the area. The lake is a very important source of irrigation for many farms and rice paddies in the Bedugul region. Because of its surrounding temperatures and irrigation system, the area around Lake Bratan is blessed with high fertility, and for that reason Lake Bratan is also known as the Lake of the Holy Mountain. It takes around 2-hours to drive from Denpasar to CandiKuning Village, Baturiti district, Tabanan, where the lake lies. 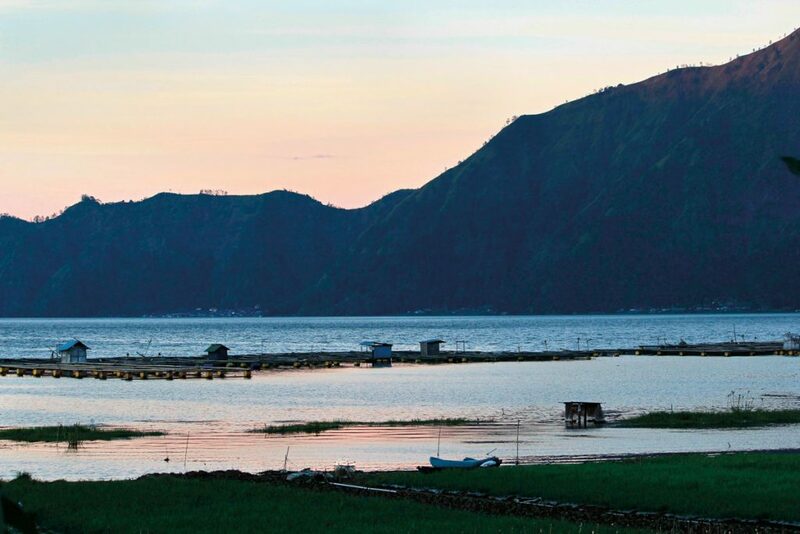 Lake Batur is Bali’s largest and widest lake with an area of approximately 18 square kilometres. The large crescent shaped lake sits within the old caldera of Mount Baturand issurrounded by the high walls of the crater rim, with an active volcano of Mount Batur adjacent to it. Located in the mountainous area of the Bangli Regency on the southeastern side of the Batur caldera, the lake lies at the feet of two majestic surrounding mountains, Mount Batur and Mount Abang. The crater is situated approximately 500 meters above sea level, and a couple of hot springs can be seen surrounding the lake with one in the middle of the lake. The water is much cooler than the other lakes in Bali. Try to dip your fingers while boating in this lake to feel how amazingly cold (but fresh!) the water is. On the journey to the lake via Bangli or Tampaksiring, the ashy residues and active hot springs reveal its volcanic history. As you get closer and continue over the last ridge, the massive outlining of the crater becomes visible; expect a large smile to peel across your face when you encounter this moment. You can continue along the road from Penelokan, it continues right around the rim towards Kintamani to circle around the crater. 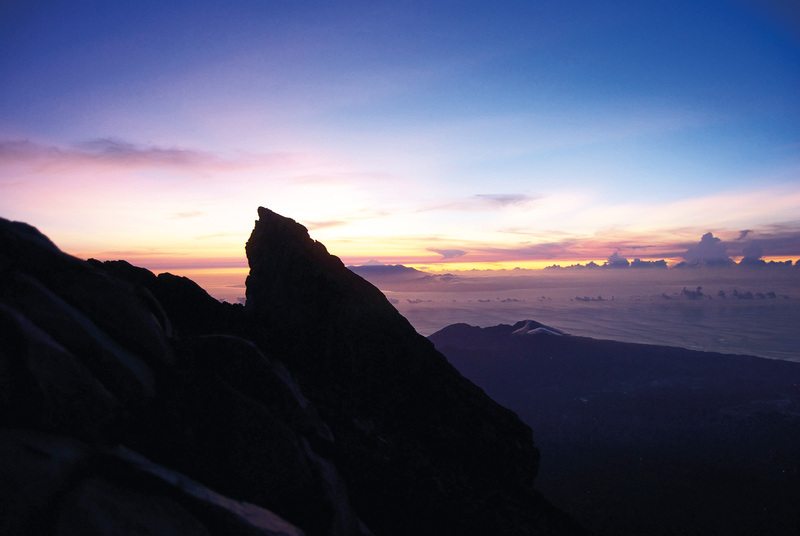 The majestic and spectacular view of Lake Batur can also be viewed from Kintamani. The only boat access to the lake is through the Trunyan village, home to the Bali Aga people. These local indigenous inhabitants are true descendants of native Balinese and have been isolated from the other inhabitants on other parts of the island. They communicate in an ancient form of the Balinese language and to date still practice ancient traditional Balinese culture and religion. An interesting part of their culture is that when one of their tribesmen dies, they are neither cremated nor buried, but laid under a sacred tree, the TaruMenyan, inside their open air cemetery. The members of the tribe believe that roots and the branches of this sacred tree helps to mask and remove the odour of the rotting, decomposing bodies. 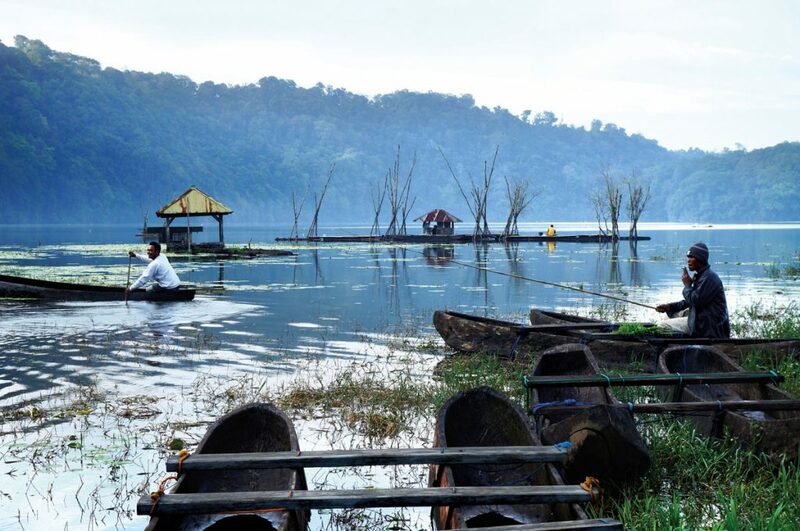 Lake Buyan is one of Bali’s unexposed and untouched attractions. Located in Pancasari Village, in Sukasada District, Buleleng Regency, the lake spans approximately 4.5 square kilometres just below the northern rim of the Bedugul caldera. Situated in a plateau region characterised by generally very wet and cool climates, Lake Buyan is surrounded by lush vegetation, featuring fog and cool air, which allows one to appreciate the authenticity of nature’s wonders. The sight of it alone has wonderfully soothing effects that help to temporarily take away the stress of daily life. Getting to this lake is a bit tricky, involving a 3-hour drive from Denpasar and following the road winding up the hill, where you can see an increasing number of monkeys, before you arrive at the junction on the top of the hill. Turn left at this junction and continue to follow the quiet asphalt road which leads you to the lake. A community pool, known as TelagaAya, is connected to the lake via a narrow canal. TelagaAya is located between the lakes of Buyan and Tamblingan, which are separated by a forest-covered hill. At the top of the hill, AsahGobleg village is the primary vantage point with panoramic views of both lakes and the surrounding area. Make sure to get your perfect selfie with the lake in the background from the lookout at AsahGobleg Village on the trek down to the lake. Encircled by coffee and clove plantations, Lake Buyan has a camping site at its southern edge with the ground being flat there. However, the most common activities are boating or fishing. Hiking or trekking is doable, but best done with local guides, granting scenic views of the landscape. For those who are into mediation and yoga, Lake Buyan offers a perfectly peaceful, serene atmosphere, ideal for such activities. Nature lovers and eco-tourists should find the entire area as a whole an ideal getaway. With limited tourist activities and the absence of human intervention, Lake Buyan still maintains its natural, intact ecosystem through protection of its fragile environment and promoting eco-tourism. Lake Buyan is closely related to Lake Tamblingan in terms of location and ecosystem, and therefore both lakes are generally referred to as Bali’s Twin Lakes. An interesting fact is that Lake Buyan and Lake Tamblingan used to be one whole lake until a landslide separated them in around the year 1800. Now they are separated by a ridge almost 2 kilometres wide. Lake Tamblingan exudes a mystical appeal and charm, with some regarding it as having the most unspoilt natural scenery in comparison to Lake Bratan or Lake Buyan. The lake is located in the heart of Bali’s farming area and the slopes are covered with coffee plantations, vegetable fields and rice paddies. Its official location is on the north slope of Mount Lesung, Munduk Village area, Buleleng Regency, about 3 hours from Denpasar. You will have the best experience just driving to this place with the cool wind blowing on your face and the feeling of pure, clean air all around you. It is advisable to pull over for a few photographs or have a small picnic by the road. The entire lake area is protected land within the 4356-acre Batukaru Nature Reserve, which is a major reason that both Lake Buyan and Lake Tamblingan have become increasingly popular with mountain trekkers, adventure seekers, bird watchers and eco-tourists. And since the lake is located at such great heights, you will find that it is mostly covered in fog that casts a beautiful spell on tourists and locals alike. The depth of the lake and reflection of the surrounding trees creates gorgeous hues of blue, green and grey that shimmer across the water’s surface like a palette of paints.Though motorized boating is not available on this lake, you can rent a rowing boat or bring along your kayaks to explore further. Fishing is also permitted. You can opt for a jungle tour, which involves crossing the sacred Tamblingan Lake by an old-style, hollow canoe. Near Lake Tamblingan, visitors can perform activities, like trekking in the tropical forest with a variety of distances, with trips ranging from 2 to 8 hours. The idea is to spend quality time in and around the lake, and absorb its breathtaking beauty. There are a few sights worth visiting in the vicinity: numerous temples can be found on the outskirts of Lake Tamblingan, and the most popular one is Gubug Temple. This water temple, which uses the traditional ‘Subak’ irrigation system at the edge of the lake, is a must visit place if you are around the neighbourhood. It retains much of the architectural design, as Ulun Danu Temple, but is less crowded, offering you good photo-taking opportunities. If you plan to explore ‘real Bali’ a bit more, these four lakes offer history, culture and nature in one experience. Nourish your soul in their stunning scenery, relax at the lakeside hot springs, stroll in the beautiful local villages, take a tour of the exotic plantations, or camp in the mountains and dense jungles. Very rightly said, that Bali is a true treasure trove of natural beauty. Why not see for yourself.